From basic curtain rods of all types including standard curtain rods to double curtain rods, triple curtain rods to bay window curtain rods and corner curtain rods it is offered here. You will find clear curtain rods, extra wide curtain rods and cafe rods for all your shorter curtains. Thats not all as curtain rods for the shower along with tension curtain rods are also available. All curtain rods are offered at great discount prices. We handle a wide selection of various types of curtain rods, so if you don't find the curtain rod you are looking for online, please call our knowledgeable and helpful customer service team for assistance and great pricing. The Bay Window Curtain Rod selection includes 3/4" and the wide pocket 2 1/2" sized bay window curtain rods as well as standard sized corner curtain rods. Both the wide pocket bay window curtain rod and the standard pocket bay window curtain rod will fit any angle bay window. The corner curtain rods which are only available as a double rod, but can be used as a single corner curtain rod by using only one curtain rod. The corner curtain rod can be used for inside corners or reversed for outside corners and is ideal for curtain panels and valances. Decorative traditional and contemporary, these cafe curtain rods are similar in use to sash rods and are ideal for your cafe curtains. 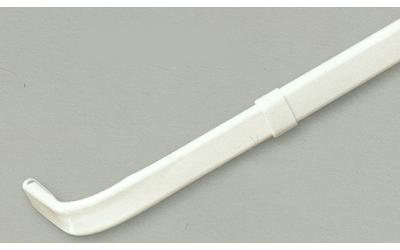 A cafe curtain rod is a narrow metal or plastic rod used to hang lightweight cafe curtains. Cafe curtain rods generally are attached to the wall or window frame with brackets, although some cafe rods are telescoping, tension rods with rubber tips; which can be used to anchor a rod in between two walls or inside deep window frames. Cafe curtain rods were traditionally used to hang kitchen curtains on the bottom half of the window. The Crystal clear curtain rods by Graber includes clear curtain rods, clear magnetic curtain rods, clear arched rods, clear cafe rods and clear sash rods. These clear curtain rods disappear under sheer and lace curtains making them a no show curtain rod. Bendable curved curtain rods for arched window treatments can be found in these arched window curtain rods. Choose from wrought iron scrolls for stationary window treatments and scarves to flexible curtain rods as well as arched curtain rods and curved curtain rods. Standard/Plain Curtain Rods, Double Curtain Rods and Triple Curtain Rods, including curtain rod extenders to make extra long curtain rods. 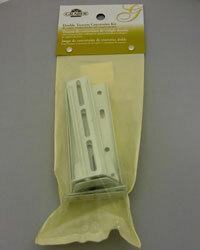 These curtain rods come with a smooth plastic no sag end insert for use to protect curtains when shirring onto the rod. 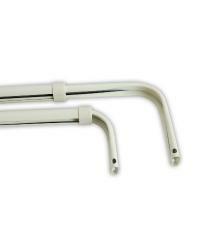 Multiple adjustable widths of curtain rods are available along with various sized returns. 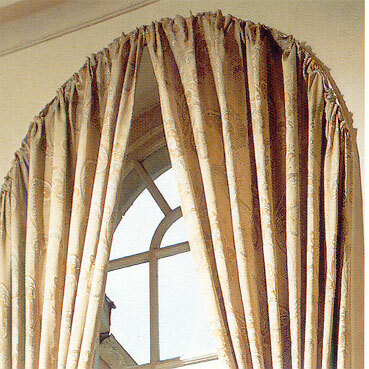 Curtain rods are great for window valances and stationary curtain panels. The tension curtain rods consists of spring tension rods and tension rods for hanging your curtains without using screws in side windows, closets and your shower as well as being the perfect choice for other decorating options. Wide curtain rods for a variety of window treatments including valances and curtains with large rod pockets. These large wide curtain rods are also commonly known as Dauphine rods and offer an alternative to the standard sized curtain rod. 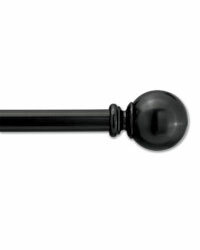 These wide curtain rods are offered in 2 1/2" and 4 1/2" sizes for a variety of window treatment options. Graber Commercial Drapery Track Systems & Hardware offers quality ceiling and wall mount curtain tracks for heavy duty commercial use. This selection of drapery track and curtain track is the perfect choice for contract use as well as for heavy draperies for residential uses. Choose from a variety of sizes and track combinations that includes baton draw as well as cord draw with all the hardware parts and accessories. Graber Curtain Rod Hardware and parts complete selection of accessories available to help complete the look of your window treatments. 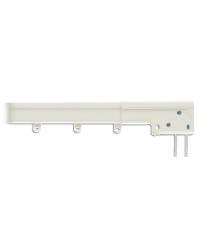 Choose from curtain rod carriers, curtain rings, traverse cord, cord tension pulleys, mounting brackets, center supports, curtain rod brackets, extenders, as well as curtain pulls and other hardware accessories and parts. Shop from Graber Curtain Rods complete selection of standard curtain rods, double curtain rods, cafe curtain rods, wood curtain rods, clear curtain rods, spring tension curtain rods, bay window curtain rods, sash rods, corner curtain rods as well as extra long curtain rods and more in a wide range of sizes and styles. Graber Traverse Rods offered in standard duty traverse rods to heavy-duty traverse rods, and super heavy duty traverse rods all in a variety of different sizes and rod combinations. Graber offers two-way draw traverse rods to one way left and one way right as well as traverse rod sets with curtain rods. 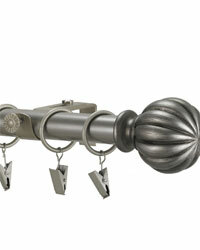 Shower Rods for decorating your bathroom are available in unique looks that are not typical. Along with these shower curtain rods are designer spring tension rods and continental rods for hanging shower curtains that are offered for looks that will be exclusive to your bathroom. Conceived in 1892 by S.R. 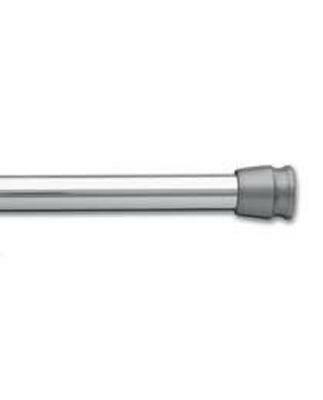 Scottron under U.S. Patent # 481,720 the first curtain rods design is still widely used today. It may have originated over 100 years ago, but its original design has been expanded upon and today there is a wide selection of choices for decorating. Window covering curtain rod options today offer choices for valances, sheers, rod pocket curtains, arched windows and other specialty drapery applications. Choose from basic curtain rods for single window treatments to double rods and triple rods for more elaborate treatments. Standard duty to heavy duty curtain rods are available along with magnetic rods for attaching curtains to metal surfaces without making holes. 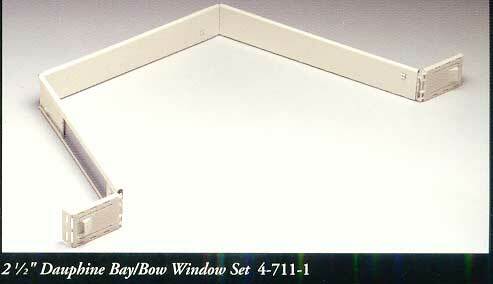 If you have a bay window or need to go around a corner, its not a problem, there's a curtain rod for that. Cafe curtain are a breeze with rods designed especially for those window treatment applications. 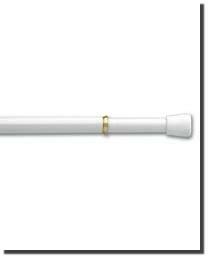 The similar in use, sash rod is also available along with tension rods for no holes, spring pressure attachment. Included in the spring tension line are shower curtain rods that are great for use in decorating your bathroom and as closet rods. 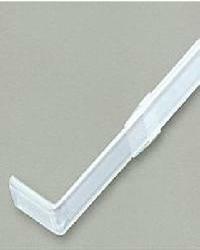 Clear curtain rods that are flexible and great for use in arched windows as well as for use with transparent fabrics where the rod may show are also featured. Extra wide rods are also offered, not only in height with the 2 1/2" and 4 1/2" Graber Dauphine rods for flat pocket curtains, but also extra long curtain rods along with curtain rod extenders. 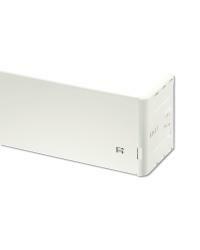 Parts and hardware for curtain rod repair is also offered.